The House is moving quickly to bring the multi-year highway bill to the floor for a vote as early as Thursday. NRMCA needs your help to secure passage of the bill which includes important provisions to the ready mixed concrete industry. Your representatives need to hear from you on how important these issues are to the ready mixed concrete industry. Tell them to act now and pass this bill in order to keep highway and road projects moving, and ready mixed concrete pouring in the construction and transportation industries. Please click here to tell your representatives to act now and pass the highway bill. Hard surfaced recreational trails are a common amenity of modern development and concrete trail construction is another of one of those overlooked market opportunities, reports NRMCA Senior Vice President, Local Paving, Jon Hansen. "The concrete industry is giving up to flexible paving without a fight," Hansen said. 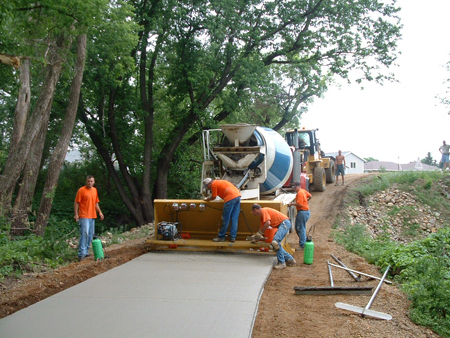 "Equipment innovations like pull behind slipform pavers (shown below), roller compacted concrete, place with asphalt equipment and even pervious concrete have all found their place in recreational trail construction in many places in the U.S.
Click here to find out about trail construction in your state. For more information, contact Jon Hansen at jhansen@nrmca.org. Life cycle cost analysis (LCCA) is an analytical technique that can be used to compare alternative designs by considering significant costs over a defined analysis period. For an LCCA to be meaningful, credible and provide the information needed to make the best selection possible, the economic analysis must reflect the most likely expenditures for each alternative over the analysis period as accurately as possible. The current LCCA practice is to assume that prices of materials are relatively stable and inflate at the same rate as the average for all goods in the economy (quantified as the consumer price index - CPI). However, 40 years of national data from the Bureau of Labor Statistics (BLS) shows that construction materials have different rates of inflation and can vary significantly from the CPI, which if not accounted for can seriously bias the results. The PDF file and PowerPoint presentation describe the issue and remedies in greater detail and this spreadsheet shows the impact that "Real Price Changes" can have on a LCCA for competing asphalt and concrete pavement alternatives using future material price projections as outlined in the MIT CSHub Research. Questions may be directed to Jim Mack, P.E., director of market development at CEMEX, at jamesw.mack@cemex.com. Jim presented a seminar on utilizing these LCCA tools for concrete paving promotion at NRMCA’s recent ConcreteWorks event in San Antonio. The Connecticut Chapter of the American Society of Landscape Architects, with the help of Connecticut Concrete Promotion Council Executive Director Jim Langlois, built upon last year’s successful "Concrete 101" Day by sponsoring another day-long continuing education program for landscape architects, engineers and contractors dealing with hardscapes in the state: "Concrete 202". Langlois helped bring in speakers on a number of topics, including NRMCA Senior Director, Local Paving, Doug O’Neill who addressed the issue of pavement cracking. O’Neill provided the attendees with a better understanding of the hydration process and expanded into why proper jointing procedures are so important, when reinforcement might be necessary and the need for improved testing. He concluded the day with a presentation on the environment and concrete, informing the audience on the concrete industry’s efforts to develop a Product Category Rule, Environmental Product Declarations, responsible sourcing guidelines and material ingredient disclosures. Of the 55 attendees, the promotion team gathered cards from numerous design firms seeking further information, including representatives from the University of Connecticut which is working on several pavements on its Storrs campus. There is still time to register for "Increase Your Profits with Roller-Compacted Concrete," a Webinar targeted at helping ready mix producers enter the RCC market. The Webinar will be held Tuesday, November 10, at 2 p.m. Eastern time and is free to NRMCA members. NRMCA Senior Director, Local Paving, Phil Kresge will host the program and will be joined by Steven Tripp, marketing manager for NRMCA Producer member Chaney Enterprises, Gambrills, MD. "For any ready mix producer that wants to increase profits, attending this Webinar is a no-brainer," says Kresge. "RCC provides the opportunity to increase production without having to add additional equipment or manpower. This webinar is focused on helping ready mix producers understand and capitalize on that opportunity. In short, this Webinar will show you how to sell more concrete than you can deliver!" Kresge emphasizes that the Webinar is not about design and construction of RCC and, therefore, is not intended for the design community. As part of the presentation, Mr. Tripp will share Chaney’s experiences with RCC and how it has helped its production and bottom line. "From our experience, producing RCC is like printing money from your ready mix plant. It’s a game changer for our industry," Tripp has stated. Click here to register. For more information, contact Phil Kresge at pkresge@nrmca.org. Last week, NRMCA Vice President of Sustainability Tien Peng presented "LEEDv4: Keeping Up with the Acronyms" to industry members and specifiers at the Virginia Ready-Mixed Concrete Association's (VRMCA) annual workshop and the Cement & Concrete Products Industry of Hawaii’s annual conference. These events allowed NRMCA the opportunity to update the architecture and engineering community on changes to the green building rating system as well as concrete industry sustainability initiatives. The VRMCA workshop also featured NRMCA’s Gregg Lewis, who presented the "The High Cost of Ignoring Life Cycle Issues in Building Construction". The new version of LEED takes a more integrated design approach, pushes for material disclosure and requires more technical rigor, each of which potentially gives the concrete producer more influence on building projects. NRMCA has three initiatives to help members achieve the new product disclosure goals. NRMCA established its EPD Program Operator status in order to help concrete producers and suppliers meet new disclosure requirements cost effectively. NRMCA is also piloting a new responsible sourcing program which will go live early 2016. Another project will provide a methodology and guide for concrete producers to report material ingredients and chemical constituents of their products. NRMCA encourages its members to participate in local professional groups, such as AIA, ASCE or USGBC local chapters, and offer topics and speakers for education programs. For more information on NRMCA sustainability programs, go to nrmca.org/sustainability or contact Tien Peng at tpeng@nrmca.org or 206-913-8535. Nominations are open for the NRMCA Promoter of the Year Award, State Affiliate Promoter of the Year Award and the Lifetime Achievement Award for Promotion. These awards will be presented at the association’s annual convention in San Diego, March 13-15, 2016. Nominees for Promoter of the Year must be current employees of NRMCA producer members; nominees for the Lifetime Achievement Award must be former employees of NRMCA member companies who are retired or deceased and nominees for the State Affiliate Promoter of the Year must be a current employee of the Affiliate and have worked in the industry for at least five years. You can help industry promotion champions get deserved recognition by nominating them for these prestigious awards. The most recent award winners are Theron Tobolski, formerly of Prairie Materials (Promoter of the Year), Jereme Montgomery, Nebraska Concrete & Aggregates Association (State Affiliate Promoter of the Year) and Mike Shydlowski (in 2013) , retired from BASF (Lifetime Achievement). The deadline for submitting nominations is Tuesday, December 31. More information and nomination forms are available by contacting NRMCA's Glenn Ochsenreiter at 240-485-1140 or by e-mail, glenn@nrmca.org. NRMCA is proud to recognize the Association's newest members that have joined after January 2015. This addendum also highlights member updates since the original directory's publication. The addendum can be accessed from NRMCA's Web site. • Selecting a Bridge Joint System, Joseph Becker, RJ Watson, Inc.
• Details, details, details: Dealing with clean-ups, small load charges... the list goes on. This class is highly interactive so your staff can try out new things in a safe environment then "bring home the bacon" to your company. Media articles on Congress, transportation infrastructure, regulation, taxes and other subjects, each of which relate to the ready mixed concrete industry, are updated each week by NRMCA's Government Affairs staff. To access the most recent compilation of articles for October 26 - 30, 2015, please click here. The November issue of Concrete Capitol Connection is now available online. The issue includes updates on federal transportation funding, EPA's carbon emissions rule, the national mitigation investment strategy and the federal budget agreement. Click here to read more. Updated in 2015, the ASTM Standards for Ready-Mixed Concrete, 6th Edition has 38 current ASTM standards and includes 20 newly updated standards. This compilation is relevant to other methods of producing concrete, such as precast and site mixed concrete. It represents the latest information in the industry and is a valuable resource and essential reference for users of C94 and C685, specifiers, engineers, architects, contractors, builders, testing laboratories, concrete material suppliers, concrete producers and students. 260 pages; published in 2015. By special arrangement with ASTM International, this publication is available only to NRMCA members at a considerable discount from the ASTM list price. Member price for up to 9 copies is $120; 10 or more are $110, plus shipping. Now bigger and better, the Mixer Truck Driver's Manual educates truck mixer drivers about concrete and customer relations. It also highlights driver duties, safety precautions, equipment inspection and maintenance procedures, and what the driver should do in case of an accident. This 74-page manual is easy to understand and contains common sense information every driver should know. Order online today and receive 15% off. Regular member price is $16, Internet Special is $13.60, plus shipping. Use discount code: ISNOV15. Parking Lots-Are You Getting Your Share?